Males have short, weak, reedy note. 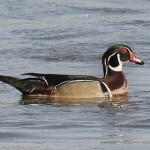 Females – similar to mallards. Description: Body blackish-brown, face and foreneck paler. Speculum violet and may show thin white edge. Yellow bill. Female bill is dull green sometimes flecked with black. 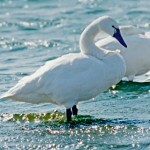 Habitat: Large marshes, lakes or reservoirs. Breeds in wooded swamps. 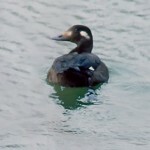 Where in Nebraska: Rare spring migrant and fall migrant east, rare casual elsewhere. Rare casual summer visitor statewide. Rare regular winter visitor east. Fun Facts: The American Black Duck often hybridizes, interbreeds, with Mallards so there is often competition for resources. 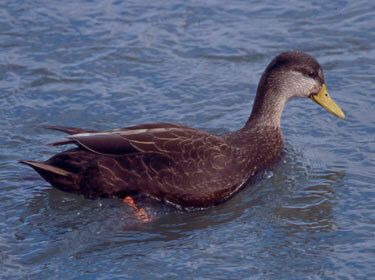 Additional Information: Mallard-Black duck hybrids are becoming increasingly common.